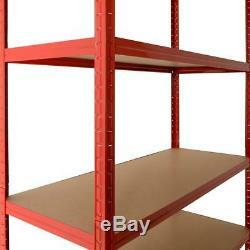 6 PACK EXTRA WIDE 120CM 5 TIER HEAVY DUTY BOLTLESS INDUSTRIAL RACKING STORAGE. 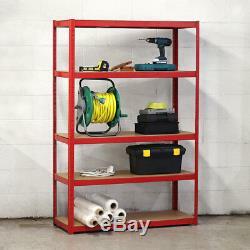 Large heavy duty steel framed 5 tier shelving unit. 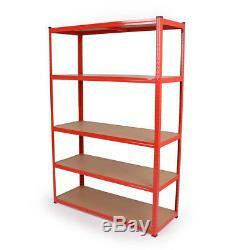 Constructed from grey powder coated steel angle iron frame with 5 medium density 5mm fibreboard shelves. Unit slots easily together, no bolts or fixings required to assemble. Size when assembled: H183cm x W120cm x D46cm. Please don't mistake this with smaller, lighter shelving which looks the same. This is wider (1.2m), taller (1.80m) and stronger. Each Rack can be split into two halves effectively creating two solid workbenches as pictured above. 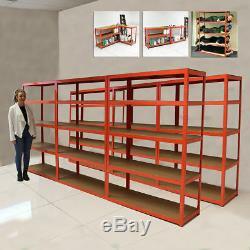 All shelves made from solid 5mm MDF boards capable of holding 200KG each. 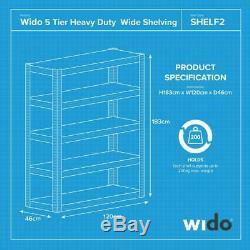 Check out out full range of Heavy Duty Shelving. Cancellation if you change your mind within 14 days. You may cancel your order without reason at any time up to 14 days after the day you (or someone you nominate) receives the goods. If goods are split into several deliveries over different days e.
Your order will be cancelled when we receive the request from you. If we havent sent the goods to you before your order is cancelled. If the goods have already been sent to you at the time of cancellation. The costs of returning the goods to us are paid by you. Goods not of satisfactory quality, not fit for a specific purpose you have told us about ot that have been misdescribed. You may reject the goods within 30 days of the goods being delivered. Unless you return the goods to us, we will be responsible for the cost of returning the goods. Please do not arrange to return your item to us unless you have prior confirmation from us, as the cost of the return may not be covered in this case. 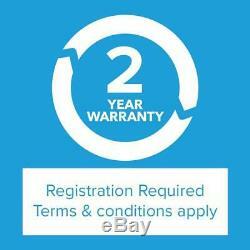 You must allow us a reasonable amount of time to repair or replace the goods. We do not have to repair or replace the goods where the costs of doing so would be disproportionate to, amongst other things, the cost of the goods. Please do not return defective goods to us without our prior consent, as return costs may not be covered. Instead of rejecting the goods or asking us to repair or replace them, you can retain the goods and require us to reduce the price of the goods by an agreed amount. Please check this listing page carefully as the answer is usually there. The item "6 PACK EXTRA WIDE 120CM 5 TIER HEAVY DUTY BOLTLESS INDUSTRIAL RACKING STORAGE" is in sale since Tuesday, January 16, 2018.